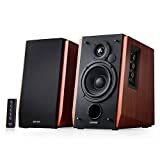 A bookshelf speaker is a compact loudspeaker that is normally sold for home audio applications that are part of a shelf stereo pair or a home theater package. They are small in size and are meant to be placed on a raised surface, such as a bookshelf. 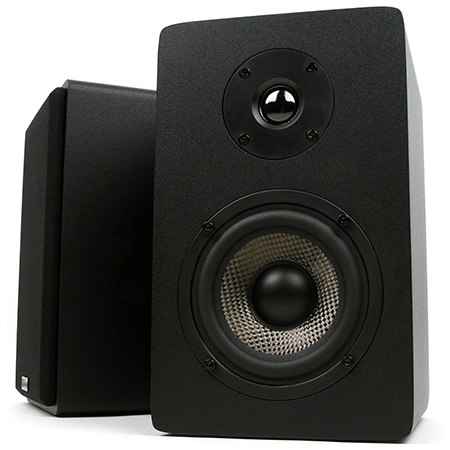 Despite their name, however, bookshelf speakers do not necessarily always have to be placed on a bookshelf. 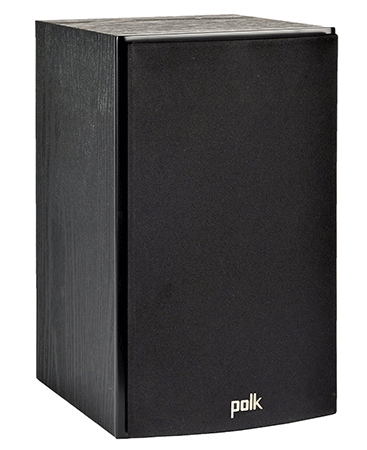 This high-performance mini-monitor speaker has a compact design in a sturdy, braced cabinet. It also has a 4.5-inch long throw pulp cone woofer and 1-inch silk dome tweeter. Another feature is its built-in 12db/octave crossover. The sounds from these monitors are very high-resolution. For the price, the design of this bookshelf speaker is rather impressive. Works well with an NHT subwoofer. 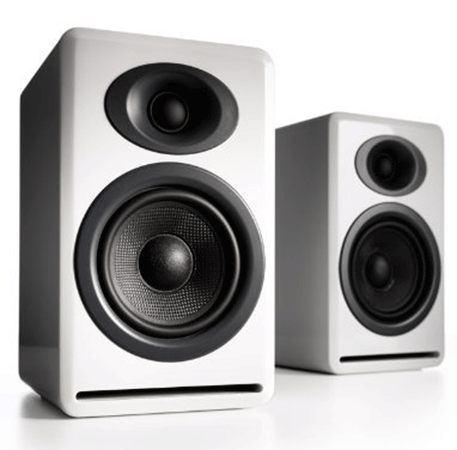 The quality of the sound from the speakers depends on the quality of the recording. If you have a low-quality recording, the speakers will air the low-quality sound. The metal speaker is rough, so be sure to use a tool to handle it if you choose to make adjustments. Do not try to turn it with your own hands. 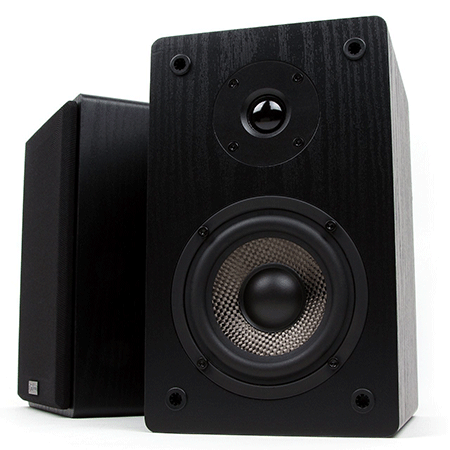 Although small, the Reference R-15M monitor speaker delivers very powerful sound from a rather miniature footprint. It will fill small to medium rooms with powerful and lifelike performances. They produce rich and clear sound. Are excellent for listening to the radio and for musical purposes. Are very compatible with other turntables. The quality of the bass is not as strong as the treble. It is not a speaker for very large rooms. Here, we have 2-way passive bookshelf speakers with a 4” front-ported design. They have a gloss white MDF cabinet with gold-plated 5-way binding posts. The silk dome tweeters have Kevlar woofers that are magnetically shielded. The frequency response is 58Hz-22kHz. 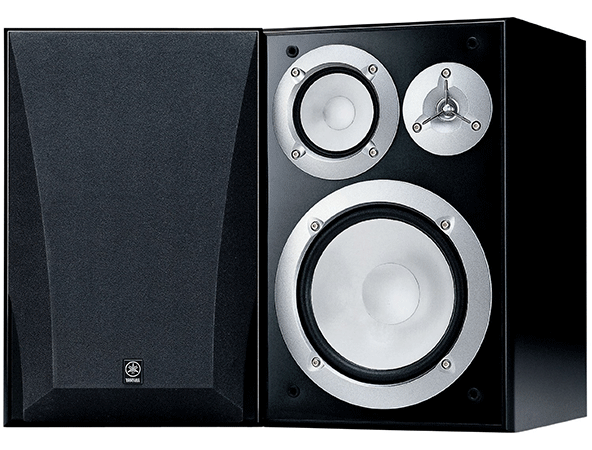 Good for college students, as these speakers fit nicely in dorm rooms. There is a lot of praise when it comes to the clarity of the speakers. Very affordable for those on a budget. There is very little static noise when playing these speakers. Depending on what type of music you play, you may potentially hear a little static noise. You may have a little trouble hearing sounds that have medium pitches. 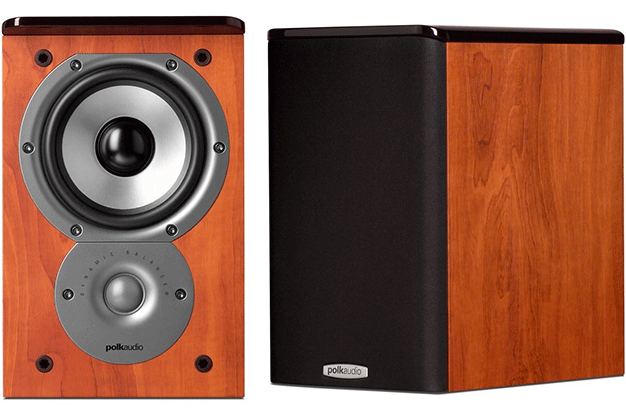 Powerful bookshelf speakers that come equipped with a 1-inch silk/polymer composite Dynamic Balance dome tweeter. 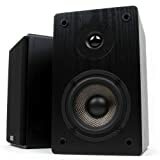 Not only that, but it also has two 5.25-inch diameter bi-laminate organic fiber cone woofers. Its frequency response is from 43Hz-25kHz, and the recommended amplification is 20-150 watts/channel. A nice small size that still produces powerful sounds. Great clarity when playing contemporary music. No static when playing songs. Better for music as opposed to home theater. The terminal connectors cannot be removed with your hand, you must use tools to do so. 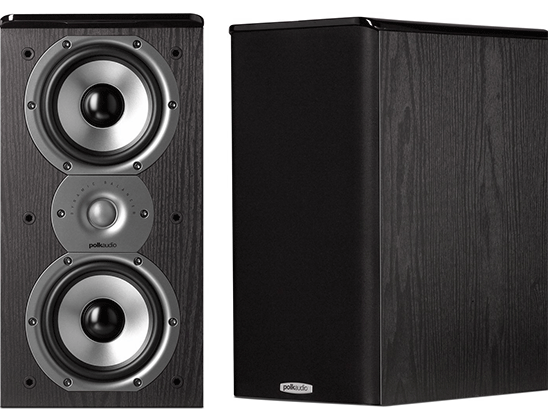 High-performance bookshelf speakers that come with 5.25-inch dynamic balance bi-laminate composite woofer. The recommended amplification for this speaker is 20-100 watts/channel. 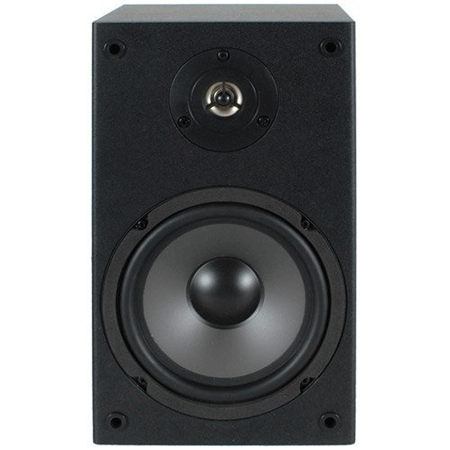 Produces solid bass that makes them usable even without a subwoofer. Can be paired with Bluetooth receivers as well. Great for mids when it comes to pitches. Pitch-wise, the highs can sound harsh initially but sound normal enough as the device becomes used long enough. The design is nothing fancy. 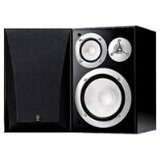 These bookshelf speakers use premium quality components that heighten overall frequency response. The cabinet is cloaked in a quality wood grain veneer that gives it a distinct and rather fancy looking design. The grill is removable and reveals the high-quality drivers and tuned port. This is a system that can handle up to 80 watts. 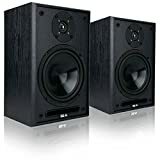 The bass from these bookshelf speakers are powerful and also produce clear vocals. Its ten-year lifespan is hard to beat. This speaker is good for both music and home theater usage. The treble sound is not as strong as the bass. These speakers don’t handle the low notes as well as the highs or mids. 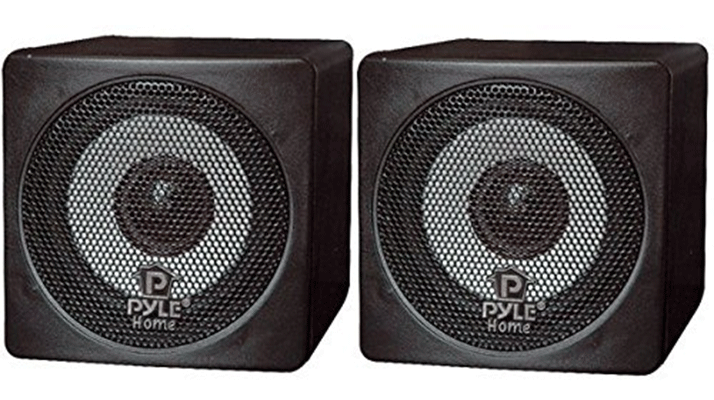 The 3-way speakers can be added in any room of your home that you would like to place them in. Each speaker enclosure has 3 drivers, and the device is magnetically shielded to suit home-theater applications. The black satin grille cloth is appealing to the eye and acoustically transparent to the ears. It can handle 70-140 watts. These are budget friendly speakers. Not only is the bass strong, but the lows and mids are as well. Works well with various types of stereo equipment. 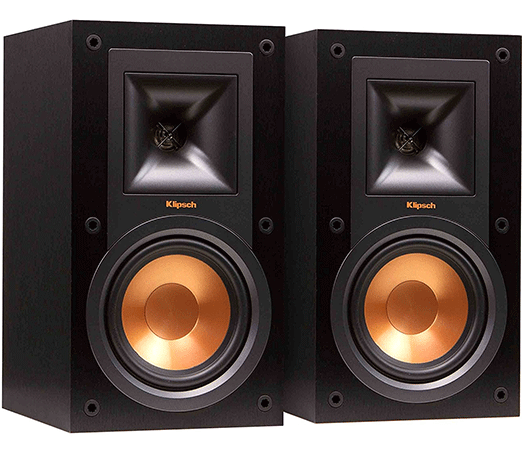 These are pretty big for bookshelf speakers. Aesthetically, they are not the fanciest looking bookshelf speakers on this list either. The patented concentric design of these drivers delivers a common acoustical center point while maintaining coherency through the crossover region. It has a 3-inch wool paper cone woofer with waveguide cone design for better dispersion of the tweeter. The 6dB/octave crossover a 3.2kHz makes for a smooth transition between the woofer and tweeter. The bass response is very good and has little distortion produced with it. They are perfect for small or medium sized rooms. Good for music or TV speakers. While good for improving TV sound for shows, it is not home theater material. You cannot use these speakers for large rooms. The dynamic balance drivers of this device once again prove to be very durable. 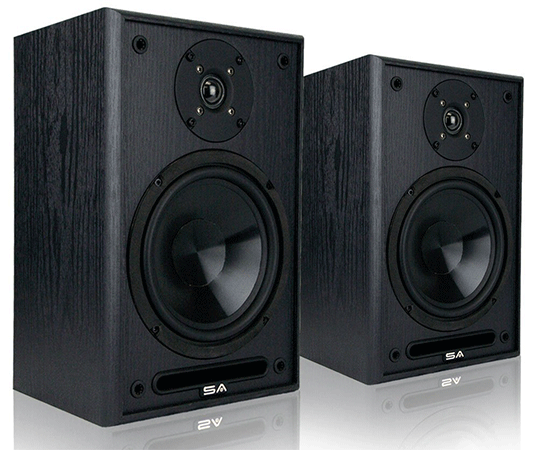 The speakers have magnetically shielded enclosures for reduced distortion from nearby video sources. The audio clarity is excellent. Works better with a subwoofer than without. 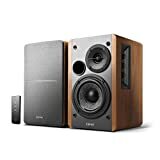 Another speaker that is pretty big for it to be a bookshelf speaker. 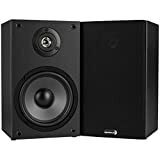 The Edifier bookshelf speakers are unique with their Bluetooth connection ability. It comes with a remote control that will allow you to switch input sources. The Bluetooth connection is, in fact, a pretty nice feature that lets you connect the speakers to your phone or computer. Produces quite a large amount of bass. These are for the most part distortion free. Larger than the average bookshelf speakers. Others close by can connect to the Bluetooth speakers and take over with their music if they are close enough to you. 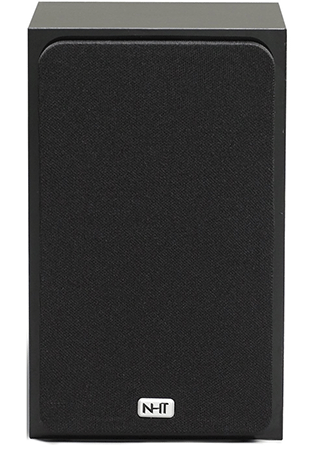 The balanced woven carbon fiber woofer enhances bass sounds. The silk dome tweeter is very high performance is good for smooth treble and accurate imaging. This specific Micca device has improved its sound quality dramatically. This budget-friendly speaker is one of the best of the best when it comes to sound quality. Doesn’t require much power when using it. A unique and appealing design. Can be used in various rooms throughout your home. There is some slight sound distortion with higher pitches. The customer service can be hard to reach when you need some questions answered. This 6.5-inch bookshelf speaker may be small in size, but its performance is high quality. It has a black ebony pica vinyl cabinet finish with a removable grill. The clarity and detail of this speaker are fantastic. These speakers are good for rooms of all sizes. It comes with a pre-trimmed speaker wire that makes set up all the easier. The design allows it to blend with all sorts of furniture. Great device for pairing with other stereo systems. The treble can sound a bit harsh sometimes when compared to the bass. While the base is good, the base extension could be a little stronger. 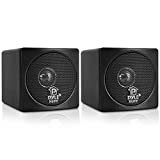 This full range mini speaker system has a frequency response of 90 Hz-18 KHz. It also has a 3” paper cone driver, with 100 watts being the power peak for this specific device. Let’s not forget the 3.6” x 3.6” x 4.6” video shield for this device either! 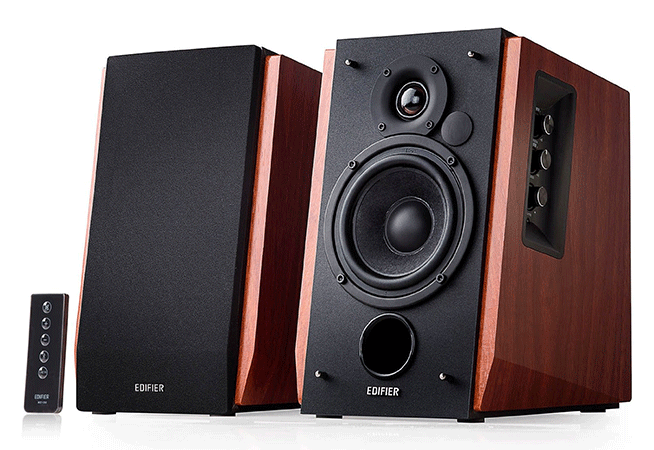 This is a good bookshelf speaker for audiophiles and newbies alike. Thanks to the size of the speakers, it’ll be easier for you to place these in any room you would like. 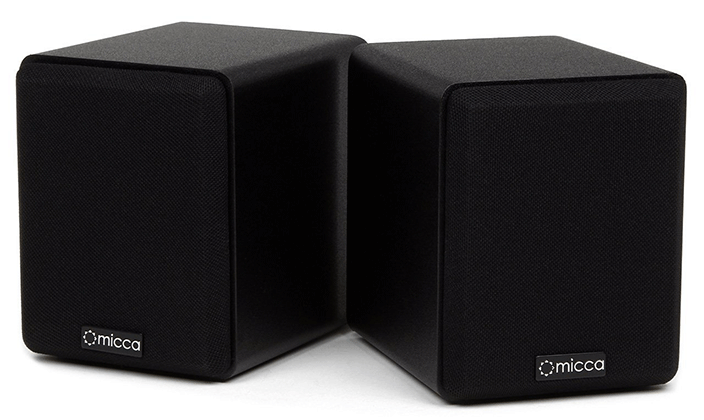 Despite being small, these speakers produce a sound that can fill a small or large room. These are speakers that you can purchase if you are on a budget. The mids and treble are not the strongest, but still solid. There is no warranty that will cover these specific speakers. 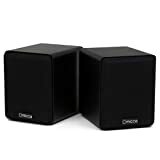 Like the other Micca bookshelf speakers on this list, this comes with a balanced woven carbon fiber woofer and the high-performance silk dome tweeter that is good for smooth treble and accurate imaging. As usual, it has a strong bass response with low distortion as well. The neutral and accurate sound signature is new to this device, and it produces some of the best vocal clarity of all the other Micca’s. The bass is not as strong as it could be, but still solid. The distortion acts up with songs that have higher pitches. 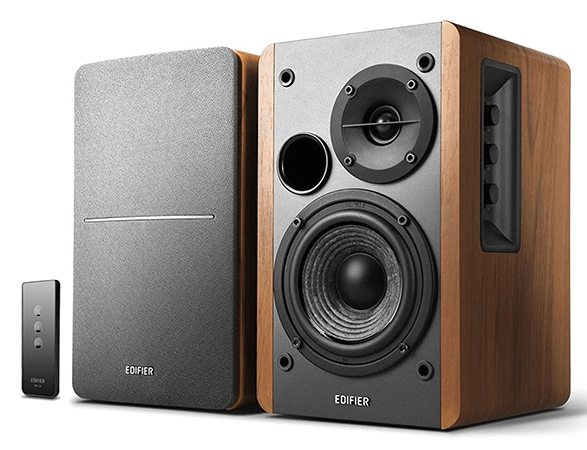 With its studio sound quality, the edifier produces great sounds ranging from highs to lows and produces powerful bass sounds as well. Its wooden finish gives it an elegant design while the remote control it comes with also comes in handy pretty often. The speakers can weaken if you play loud songs too long. This concludes the top choices for bookshelf speakers! At the very least, we hope that this list has helped you decide what type of speak suits your needs the best. Good luck with your search reader!